KioCall™ is a video conferencing application that allows users to configure kiosks secured with KioWare kiosk software to call devices running KioCall. KioCall may also be used to connect one KioCall device to another. 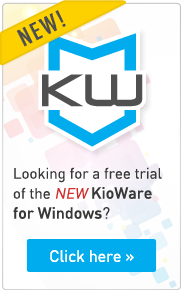 If used with KioWare, KioCall is supported by kiosks running KioWare for Windows 8.9 and newer. Download a free trial of KioWare for Windows or KioWare for Android and configure it to call devices running the KioCall desktop app. Calls can only be received when users are logged in with their user account, which are created by an account administrator. To test the calling functions of KioCall video conferencing, sign up to obtain minutes (free trial). KioCall is the application that is required for accepting calls from kiosks (running KioWare) or other KioCall app users. This app is not required on the kiosks running KioWare kiosk software. Note: If you haven't already, please sign up for a KioCall Account to obtain login information. Your KioWare Kiosk running KioWare for Windows or KioWare for Android can now make and receive video conferencing calls. 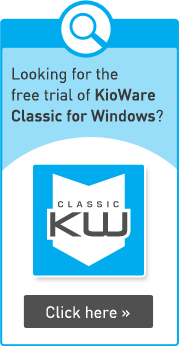 Download your free, fully functioning trial of KioWare for Windows or KioWare for Android and configure the "Communications tab" for use with KioCall. Not sure which product fits your needs? Use the Product Comparison to help you choose.